Cast: Marlon Wayans, Jane Seymour, Mike Epps, Kali Hawk, Fred Willard. Story: A parody of the popular film/novel Fifty Shades of Gray. Details: According to Variety Mike Epps, Kali Hawk, Jane Seymour, Affion Crockett and Fred Willard have joined Marlon Wayans in IM Global’s spoof Fifty Shades of Black. Wayans, who stars as mysterious entrepreneur Christian Black, is a producer and writer of the film alongside regular writing and producing partner Rick Alvarez. Mike Tiddes is directing and Open Road, which distributed both of Wayans’ A Haunted House spoofs, has set a Jan. 29 release for the U.S. Hawk (“Bridesmaids”) portrays the young woman drawn to Christian Black. IM Global launched Fifty Shades of Black after Universal’s Fifty Shades of Grey took in $570 million at the worldwide box office. Source: Variety. Cast: Mike Epps (Richard Pryor), Oprah Winfrey (Marie Carter), Taraji P. Henson, Eddie Murphy (LeRoy Pryor), Kate Hudson (Jennifer Lee Pryor). Update 10/6/16: Indie wire reported that Lee Daniels will indeed be directing “Richard Pryor: Is It Something I Said?” Harvey Weinstein announced during a press conference on this date about the biopic, which Mike Epps is starring in and Jay Z is producing. Daniels was previously attached to the project before apparently leaving it. “I can tell you that Jay is going to produce the Richard Pryor movie with Lee Daniels directing,” said Weinstein. Jay Z chimed, saying that Pryor’s story “is an American story. You’ll understand how many lives he’s touched, from every single comedian to rappers like Biggie Smalls.” In addition to Epps, Is It Something I Said will feature Eddie Murphy as Pryor’s father, Oprah Winfrey as his grandmother (who apparently ran a brothel) and Kate Hudson as his final wife. Update 9/1/14: On August 26, 2014, ET confirmed that Oprah will be playing Richard Pryor’s grandmother, Marie Carter, in Lee Daniels’ highly anticipated biopic on the legendary comedian. Pryor, who died from a heart attack in 2005, had a notoriously complicated relationship with his grandmother. Pryor grew up in a house of prostitution run by Marie, when his mother Gertrude walked out on the family when he was 10 years old. Based on an August 24th tweet from Director Lee Daniels as well as an Instagram post by Oprah it is confirmed that actor Mike Epps will play Pryor. Epps is said to have blown Daniels and the producers away with his audition. He beat out big names such as Nick Cannon (who in July hinted in a TMZ interview that he landed the role), Marlon Wayans and Michael B. Jordan (who was attached to star in the project before it changed producers) to play Pryor. Mike Epps also plays Pryor in Cynthia Mort’s still-unreleased Nina Simone biopic starring Zoe Saldana. No word yet on who will play Pryor’s widow Jennifer Lee Pryor, who’s also producing the film, though rumor has it that Kate Hudson and Anne Hathaway are both frontrunners for the role. Source(s): ETonline; Shadow and Act. “Richard Pyror was dying and mentally incapacitated when his wife duped him into signing over the rights to his name … so claims Pryor’s son, who’s trying to shut down a movie about his dad. Richard Pryor, Jr. has fired off a cease and desist letter to Jennifer Lee Pryor, demanding she stop production of the Lee Daniels directed biopic immediately. Richard Jr.’s lawyer told TMZ her client believes Pryor was in poor mental and physical health when he signed over the rights in 2005. Pryor died in December of that year. Jennifer has been battling Pryor’s children over the film — including who should play Pryor. On 7/17/14 TMZ posted a video of Richard Pryor, Jr. reporting that he has done a 180 and now feels Nick Cannon is the second most qualified guy to play his dad in the upcoming biopic … second to him. Although Cannon hasn’t landed the role yet, he is lobbying hard to get it. The Drumline star and America’s Got Talent host, mentioned he has had conversations about the film with reported director Lee Daniels. Pryor Jr. and his sister Rain previously told TMZ … Cannon didn’t have the chops to pull off the role. They thought Marlon Wayans was the right guy. But in the video, Pryor Jr. tells a TMZ photographer that Cannon’s passion for the role changed his mind and he now favors Cannon … certainly over his step mom’s choice, Terrence Howard. Source(s): TMZ, New York Daily News. Details: On January 10, 2014 The Hollywood Reporter ran an exclusive that Lee Daniels is in negotiations to tackle an untitled Richard Pryor biopic as his follow-up to The Butler. The Weinstein Company, which produced and distributed Daniels’ hit about a White House butler, will fully finance the Richard Pryor project. Michael B. Jordan, Marlon Wayans and Eddie Murphy are among the actors being eyed for the film, which has been in the works for years with different actors attached, including Wayans and Murphy. Sources say both are still in the mix, particularly Wayans, who at 41 years old is considered to be the right age for the project and whose screen test is said to have wowed Harvey Weinstein. But Jordan, who became a breakout star with The Weinstein Company’s Fruitvale Station, has emerged as the front-runner to tackle the life of the iconic comedian, who died in 2005 at age 65. Pryor, who was hailed as one of the most important and influential stand-up comedians of all time, also had a troubled side. In 1980, he set himself on fire while freebasing cocaine and suffered severe burns. Pryor’s widow, Jennifer Pryor, is producing the film. She brings to the project more than 50 pages of Pryor’s personal journals, which offer a glimpse into his brilliant, but dark, mind. The Pryor biopic has been attempted numerous times. Deadline previously reported in March 2013 that Forest Whitaker had taken over the nearly 20-year effort to bring the turbulent life of the stand-up comedy legend to the big screen under the title Richard Pryor: Is It Something I Said? Another version had Bill Condon poised to direct Marlon Wayans in the starring role for Sony Pictures. But everything took a back seat when Condon signed on to helm the final two Twilight Saga installments. Other prior incarnations include a Martin Scorsese-directed drama to star Damon Wayans, this well before Pryor died in 2005. Later, there was a Showtime pic that was to star Eddie Griffin and another attempt at a feature that was to star Mike Epps with Kasi Lemmons directing. Condon’s first flirtation had Eddie Murphy briefly interested, and then Chris Rock was briefly in the conversation. Pryor had an unbelievable life, from growing up in a brothel, rising to become comedy’s biggest stage star, pushing the envelope on an edgy TV show that was subversive and ahead of its time, transitioning to film stardom, and nearly dying when he accidentally ignited himself while freebasing cocaine. Sources: The Hollywood Reporter, Deadline, Comingsoon. 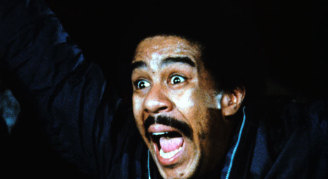 Check back for further details on the untitled Richard Pryor biopic as this story develops. Story: After exorcising the demons of his ex, is starting fresh with his new girlfriend and her two children. After moving into their dream home, Malcolm is once again plagued by bizarre paranormal events. (Synopsis taken from comingsoon.net).